Vehicle Control System Software all ROV dives in perpetuity so these videos can be used as a • Greensea Bale? re Vehicle Positioning/Autopilots data set. Students also have access to videos in the classroom • Greensea Bale? re Automated Positioning through a newly developed lesson plan to learn how to do • Greensea Bale? re Sonar Positioning scienti? c video annotation. ROV Control & Telemetry Hardware erals, some up to 30 meters (100 feet) tall, and hot ? uid gush- • Greensea Custom Design and Build ing out at temperatures up to 365°C (690°F). 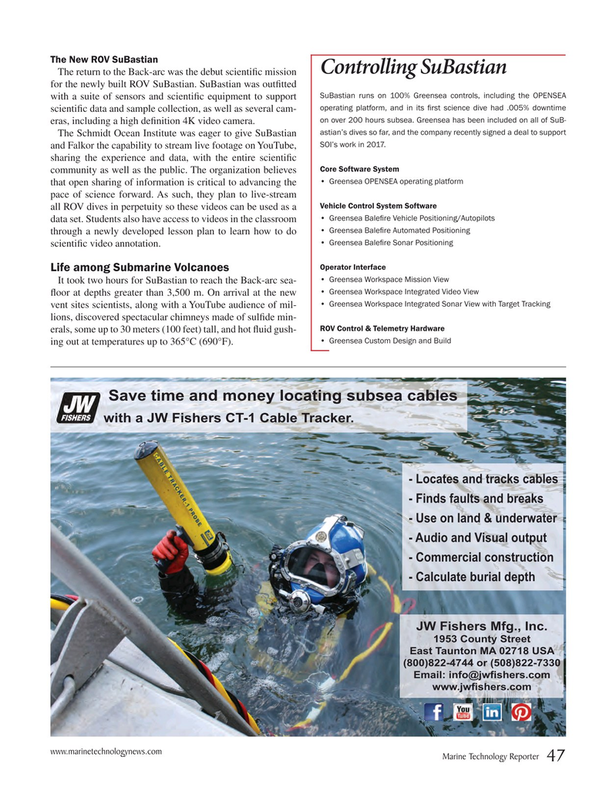 Save time and money locating subsea cables with a JW Fishers CT-1 Cable Tracker.